The official Facebook account of the town of Darien, CT.
DARIEN — @TownofDarienCT has joined Twitter and “Town of Darien, CT” is also an official Facebook page. The Twitter account sent out its first tweet on Nov. 21 to remind residents to renew parking permits as late fees would increase to $50 by Dec. 8, 2017. As of December, pictures of the ongoing construction at Public Works Garage have been tweeted and posted on Facebook. Town Administrator Kathleen Clarke Buch will run the newly created Facebook and Twitter accounts. As of Wednesday, the account is following 22 accounts and has 19 followers. The town account is following Sen. Chris Murphy, Rep. Jim Himes, D-4, as well as the Darien Health Department, police and several news outlets. Darien First Selectman Jayme Stevenson said it is important to stay in touch with resident. “We are hoping to use all available media channels to engage and keep our residents informed.” she said. 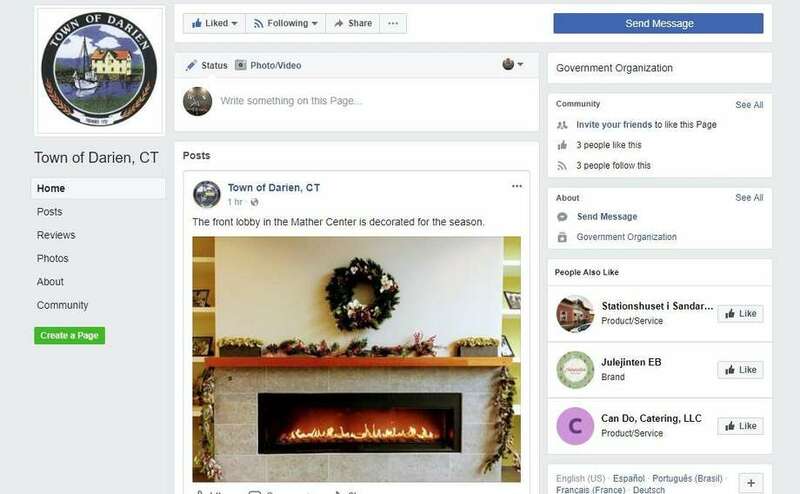 Amanda Goodman, the manager of social media for Darien Library, said she is likely to retweet or follow the account on both platforms. Nancy Sforza, Darien resident, only uses email but thinks her children could benefit from the town account.